Several years ago, when my daughter was diagnosed with severe asthma, allergies and eczema, her pulmonary specialist recommended including lean, natural meats for her daily protein and zinc intake. As a result, I discovered Applegate® Farms and I have been very pleased with the quality and selection of their organic and natural meats. Therefore, I was thrilled to learn that they have added nine new meats to their product line including Gluten-free Chicken Breast Tenders, Homestyle Chicken Breast Tenders, Wheat-Free Beef Corn Dogs, Grilled Chicken Breast Strips, Southwestern Chicken Breast Strips, Organic Turkey Bologna, Barbecue Chicken, Uncured Cooked Capicola Ham and Organic Uncured Thick Cut Bacon. I am passionate about providing my family with nutritious meat products that do not contain added nitrates, nitrites, chemicals or MSG. I can feel confident that when I serve Applegate® products to my family that I am giving them the best natural meat selection available. We have eaten the original uncured bacon from Applegate® many times over the years and my entire family really likes it. My husband prefers a thicker cut bacon slice so I was excited to make breakfast for him featuring the new Organic Uncured Thick Cut Bacon. My entire family devoured it and my husband declared it “the best bacon he has ever tasted.” Through a special partnership with Whole Foods Market, this bacon is made exclusively with Becker Lane Berkshire pork which has a “marbling that runs through it giving it a buttery flavor and superior rich, distinctive flavor.” I like that it is full of flavor yet it is not loaded with fat so it cooks nicely and does not shrink up. Applegate® is proud that this bacon has a GAP Animal Welfare Rating “3” and does not use antibiotics, nitrates or nitrites. My children are ages 3, 4 and 6 and had never tasted bologna and despite my husband’s pleas, I refused to purchase regular bologna at the store for him. That all changed when Applegate® introduced the Organic Turkey Bologna which has a nice bologna taste without all the added artificial or chemical ingredients since it is made with only natural ingredients such as organic turkey, sea salt, spices, garlic powder and organic onion. It is sliced and ready to eat and it was a big hit with my family. My husband was thrilled to have a grilled bologna sandwich in his lunchbox too! Another food that was on our “not for eating” list were corn dogs. My poor children always gazed longingly at the carnival asking if they could eat a corn dog but I would always refuse their requests because of the ingredients. Their eyes grew wide with excitement recently when I surprised them by serving Wheat-Free Beef Corn Dogs for dinner. 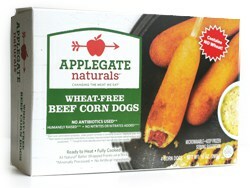 These corn dogs are all natural and feature beef hot dogs that do not contains nitrites or chemicals and the batter is a tasty blend of rice and corn. My children absolutely loved this product and I will always keep a box of these on hand for lunches or a late afternoon snack. Though I do cook many of our meals from scratch there are those busy days when I need to make a quick, nutritious dinner without a lot of fuss. 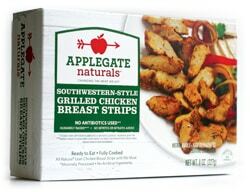 Applegate® Grilled Chicken Breast Strips and Southwestern Chicken Breast Strips are a tasty, simple way to make dinner really fast. From fajitas to a grilled chicken salad, these delicious lean, all natural chicken breast strips with rib meat are ready to eat and very tasty. I was really surprised how a frozen, pre-cooked chicken breast strip could actually be juicy and flavorful……but it is and my family really liked these served in a warm fajita with lots of vegetables. I was appreciative that I could have a tasty, healthy dinner ready to serve in less than 15 minutes! I can’t wait to try the rest of the new products available from Applegate® Farms because I am really impressed with the products that we have recently tried and I expect the same high quality with every product that I purchase from Applegate®. You are invited to visit the Applegate® website to learn more about all of the delicious organic and natural meats available and to find a store location near you that carries Applegate® Farms products. If you don’t have a store near you……don’t worry. Check out the new Applegate® online store and purchases over $100 ships directly to you for free! Connect with Applegate on Facebook and Twitter. I strongly suspect you are paid to write those praises for Applegate products while you have not mentioned even once whether Applegate uses GMO products for their livestock feed! WHY THEY DON’T POST “NON GMO” IN THEIR PACKAGES LIKE HUNDREDS OF OTHER HEALTH FOOD MANUFACTURERS DO?